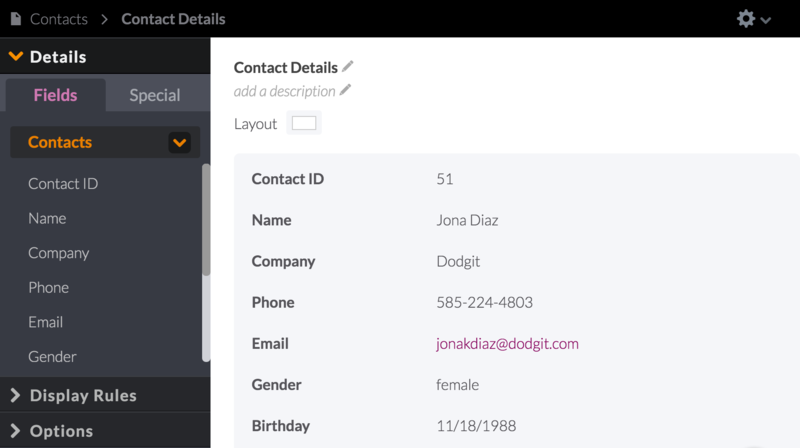 A details view is used to display fields in a flexible layout from a specific record in your database. 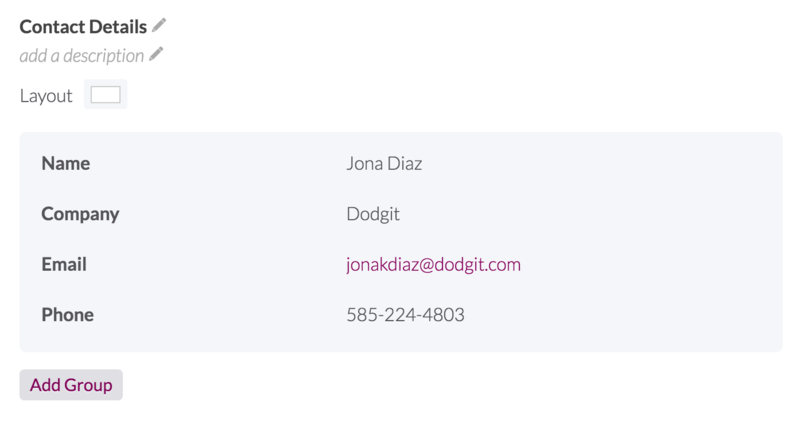 Details display fields from a specific record in a flexible layout. Any of the fields from that record's object can be used in the details layout. 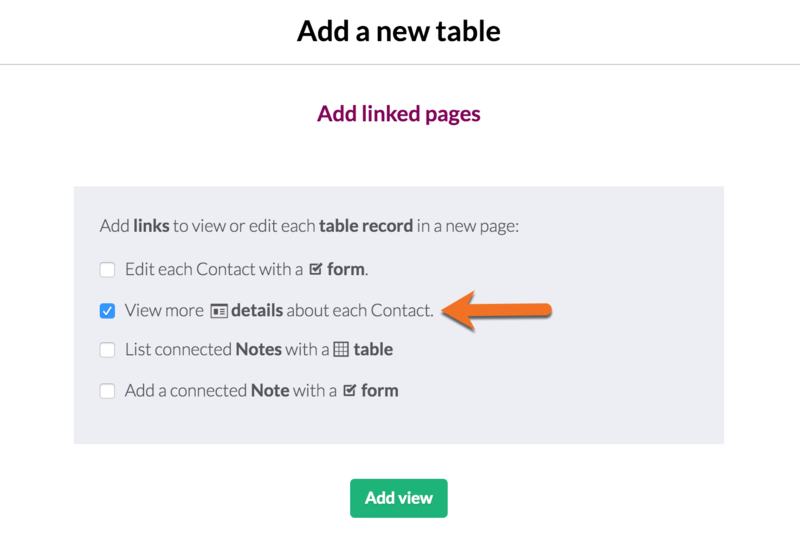 Details can only be accessed by following a link on a record from a table, list, search, or other views that can display multiple records. 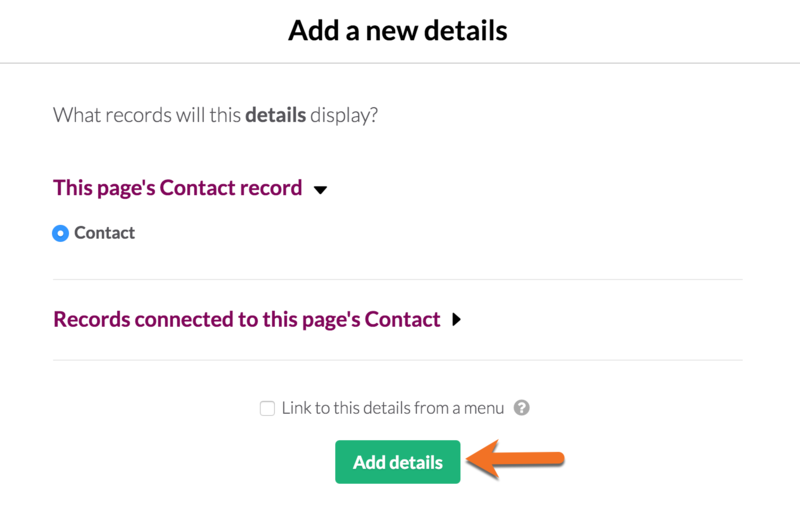 Additional links can be added to a details view to edit or view more details about that record. 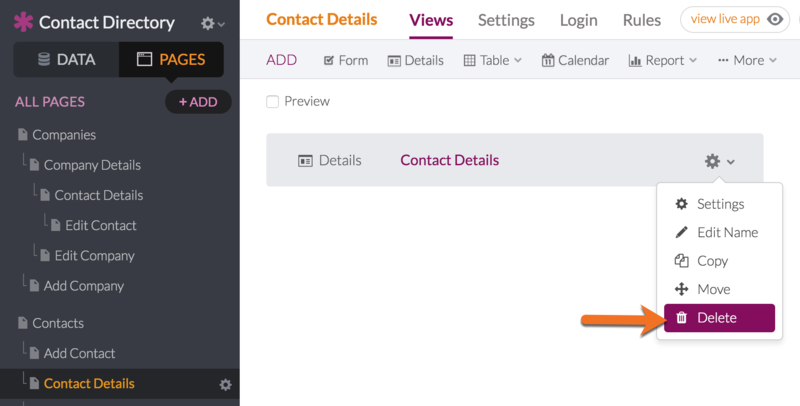 New details views will have each field from the object added to the details layout by default. The details view will open in "edit" mode where you can use the menu on the left to edit different aspects of the view. Warning: Please note that deleting a details view will also delete any child pages connected to it. 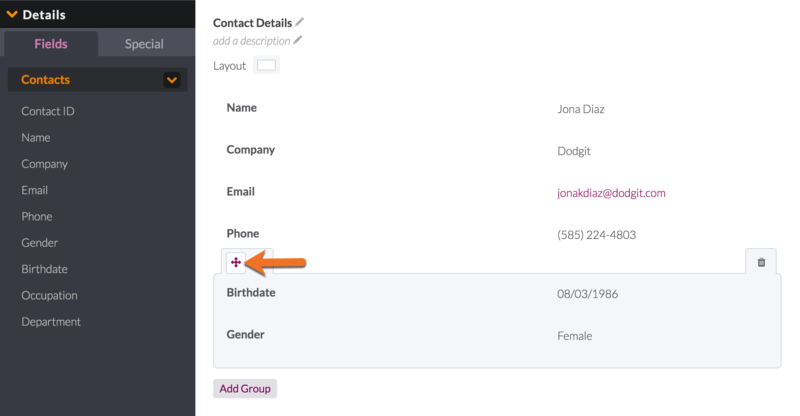 A title and description are listed above the details fields, and you can click on each to add or edit. These are optional and will display at the top of the details if added. 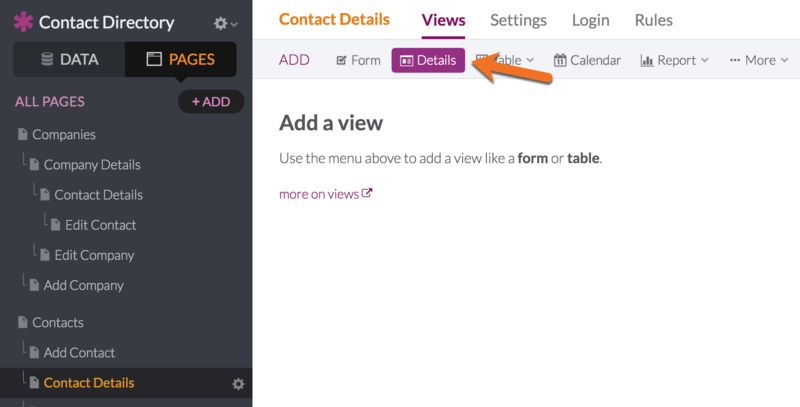 All the fields available to add to the details layout are listed in the menu on the left. 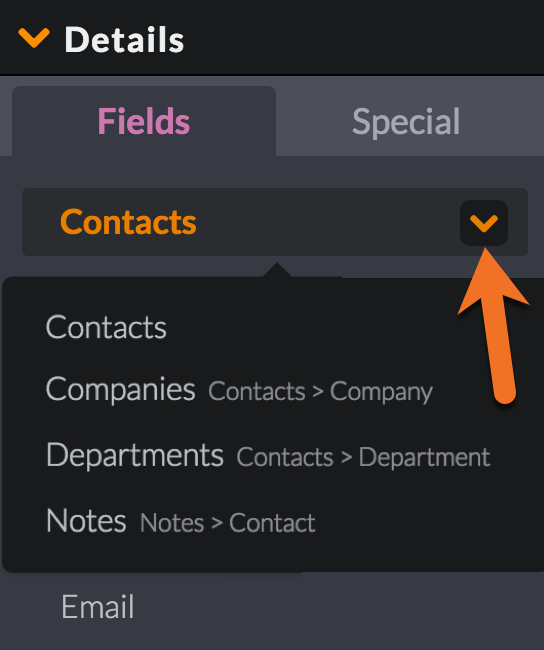 Click on a field to add it to the details layout. Link to delete record: this will add a link to delete a record. When the user clicks on the link they will be asked to confirm the delete. Clicking yes will then remove the record from the database. Link to view more details: this will create a new child page displaying all the details for this record. Clicking on the link will go to that page to view those details. Link to another page: reuse another page you've already created by linking to it. 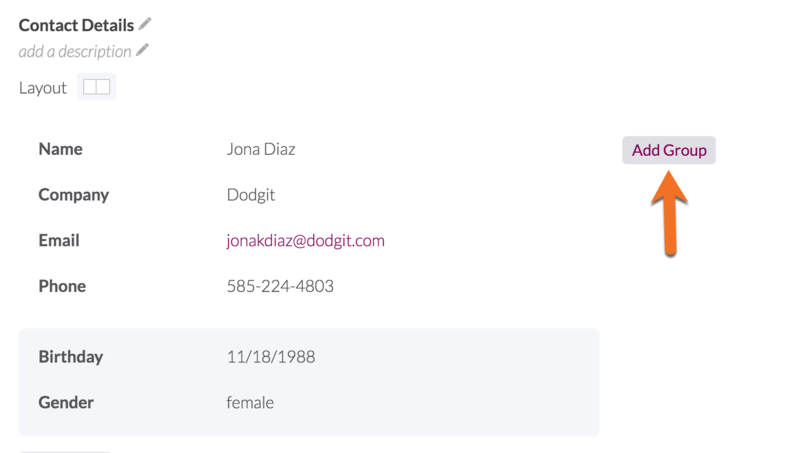 For example, if you already had a complex scene that was showing details about a contact record, we could link to that scene instead of recreating it. Trigger an action: create a link on the view and trigger an action to (a) update this record / update connected records / insert connected records / send emails and (b) redirect to another URL or show success messages. View full “Action Links” help article for further information. 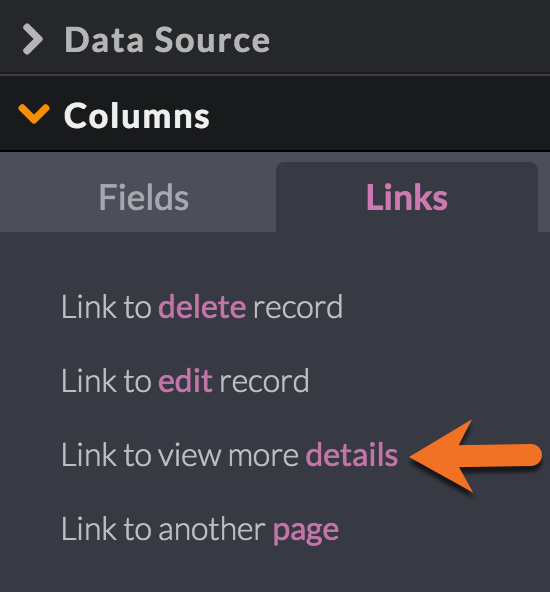 Note: This link will only display other pages with the same Data Source object as the details view you are on. Label Format: use the label format set for the group or use "Hide Label" to hide the label and just show the field value. Label: the label displayed with the field value. This defaults to the field name. Style: check any styles you'd like to add to this field. Map: this option only appears for Address fields and will show a map of the address above the listed address. The address is a link that, when clicked, will open a new browser tab for Google Maps for directions. Once you’ve selected this option, you can customize the size of the map. 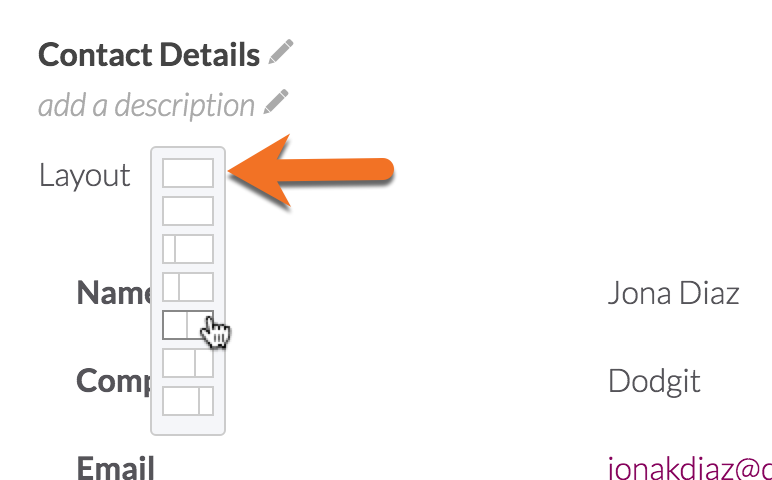 You can also click and drag a field to change the order or place it another group (see below). 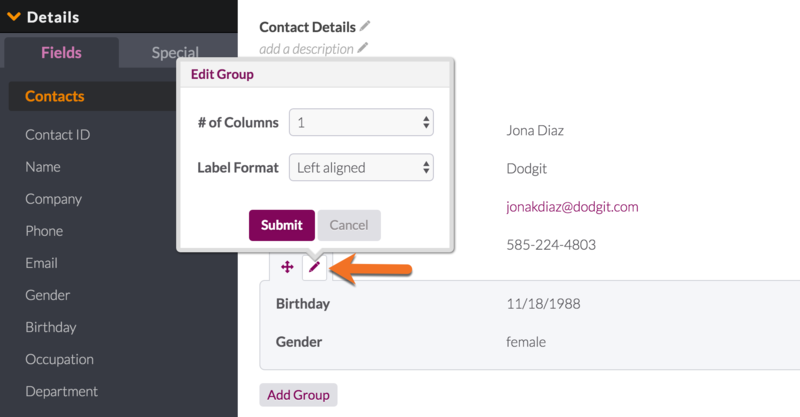 Fields are placed into groups which can have separate label and column formats and can enable more flexible layouts. The active group will always be highlighted with a gray background. When you add a new field it will be added to the active group. Simply click on another group to activate that group. # of Columns: the number of columns the group will be divided into. When you have multiple columns, your fields will be equally divided into the columns and you can drag the fields between the columns to change how your fields are laid out. Label Format: choose whether to show labels and in which position to display them. Display rules can show or hide fields based on the values of other fields. If: the condition when the rule is triggered. Then: the action the rule takes. This includes Show, Hide, or Rename label. Hide Empty Fields: when set to yes, only fields that have values will display. Any fields that are empty or null will be hidden.